The 1861-D Type Three Gold Dollar was coined at the Dahlonega Mint by the Confederacy. Type Two Gold Dollars were first minted in 1854, and immediately encountered problems in minting. Metal flow during the striking action was poor, often rendering weak reverse inscriptions. The Mint responded by redesigning Liberty’s image on the obverse, leading to a new coin type in 1856, which numismatists term Type Three Gold Dollars. In January, 1861, two gold dollar die pairs arrived at the Dahlonega branch mint from Philadelphia, but were not put into service right away. At the onset of the American Civil War, southern forces seized control of the Dahlonega Mint on April 8, 1861. Soon thereafter, the Confederates began minting coins with federal dies. An unknown number of 1861-D Gold Dollars, estimated to be less than 1,500 pieces, were coined under the auspices of the Confederacy. A small number of $5 half eagles were also produced. After the meager supply of gold bullion was exhausted, no more coins were issued. As it turned out, those were the last Dahlonega Mint coins the world would ever see. Because of its extreme rarity (perhaps as many as 65 exist today) and significant historical connections, the 1861-D Type Three Gold Dollar is one of the most coveted coins in American numismatics. Coin collectors understand that with ownership of the 1861-D Gold Dollar, one comes face to face with a tangible participant that “was there” in the earliest days of the War Between the States. The 1861-D Type Three Gold Dollar has displayed surprisingly sluggish value increase performance since Year 2000, despite its bona fide rare coin status. 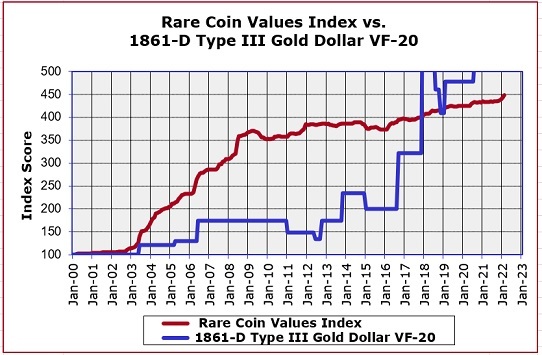 The blue line above charts the percent value change of the 1861-D Gold Dollar using Year 2000 as a baseline. The red line graphs the progress of the Rare Coin Values Index, which takes the composite percent change over the same time period of a pre-selected group of 87 rare US coins, the purpose of which is to understand the strength and direction of the overall rare US coin market. The 1861-D Gold Dollar is one of the 87 coins that comprise the Index. All data is updated monthly.